Israel has allegedly reiterated its warnings to Syria over the Golan Heights, threatening the IDF will attack Syrian tanks on its border. 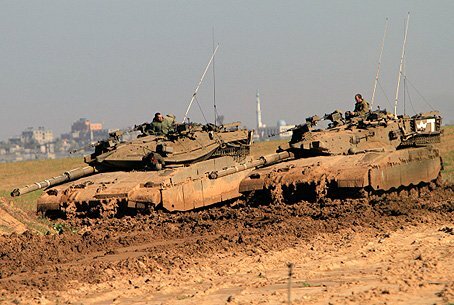 Israel has allegedly reiterated its warnings to Syria over activity in the Golan Heights, threatening in a document sent to the United Nations the IDF will attack Syrian tanks on its border. Jerusalem allegedly sent the warning to the U.N. Security Council via Herve Ladsous, U.N. Under-Secretary-General for Peacekeeping Operations (UNDOF), according to a report published this weekend in the Hebrew-language Yediot Acharonot newspaper. Israel warned it would “take action” if Syrian tanks continued to operate in the buffer zone, according to the report, which was also picked up by the Al-Arabiya news network. Tensions are rising in Israel’s northern region, as the country prepares itself for “any possibility.” Coastal police are conducting a drill simulating an emergency response to a terrorist attack on Sunday morning in Haifa, officials announced. Bomb Squad sappers, detectives and scouts are all participating, and the public was warned to expect the presence of “many police vehicles” as well as possible temporary traffic adjustments. The U.S. State Department called on the Syrian regime of President Bashar al-Assad on last Thursday to take care to avoid violating the ceasefire with Israel in the Golan Heights. “We’ve been very clear about our concerns over regional instability caused by the crisis in Syria,” State Department Spokeswoman Jen Psaki told reporters, after a day of fighting between Syrian government troops and rebels near the border with Israel.